Hello you wonderful QuiBids customers, you. No, please, don’t get up. Keep clicking on those auctions and I’ll make your acquaintance from right here. The name’s Matt and I’m your new resident blogger around these parts. Jill and Blake will still be here too (they’re my new office-mates, in fact), and they’ll be posting information to enhance your experience with our website from time to time. But I’ll be your primary blog-ministrator from here on out, and I want to know what sort of information you would find valuable. But I also want you to get to know me and vice versa, because this whole Internet thing can get sooooooo very impersonal sometimes. And that’s just no fun. Previously I worked as a writer and online editor for Oklahoma City’s informative, wonderful alternative-weekly newspaper, Oklahoma Gazette and graduated from the University of Oklahoma. Building on that theme I joined QuiBids, a terrific company with headquarters nestled right here in the comfy middle of the country’s heartland. It’s a pretty awesome place to be right now, what with the economic shift toward natural gas, the Thunder winning more NBA games than any team that doesn’t feature Derek Rose, and a vibrant artistic community that’s reaching full bloom. I guess I’m Pro-klahoman. Let’s sprint through a few quick hits: My friends call me by my last name, dudes I play basketball with say I shoot like Matt Bonner, LCD Soundsystem is absolutely the best band in the history of the known universe, I like to shoot photographs of musicians in my free time, and I do a healthy bit of tweeting. Also, I kinda have a thing for Taylor Swift. But on a more meaningful note, I’m thrilled to toss my hat in with QuiBids because I believe this company is uniquely positioned to register an enormous, positive impact on the people shop all over the world. Today being only my second day as QuiBids’ resident copywriter, I’ll testify that this company’s full of friendly people who work hard with your convenience in mind. Yesterday morning I gave the company Code of Ethics a read and got floored by their dedication to fair business practice: actively listening to and communicating with our users and avoiding conflicts of interest. After years of working for newspapers, I’d become pretty jaded toward most retailers’ practices, but there’s a healthy sense of good will and youth about this company that I’m proud to start contributing to. And by contributing, I mean using this blog space as an opportunity to help answer your questions, and provide you — our ever-valued customers — with information you can use to save time and money while shopping on QuiBids. So please sound off in the comments or feel free to shoot me an email at matt.carney@quibids.com if there’s something on your mind that you think’s worth a post on the blog. I’ll be excited to hear it! Welcome Matt! 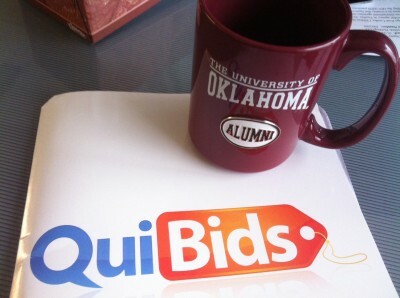 I’m excited to read your blog posts about QuiBids!